SPRINGFIELD, Mass. 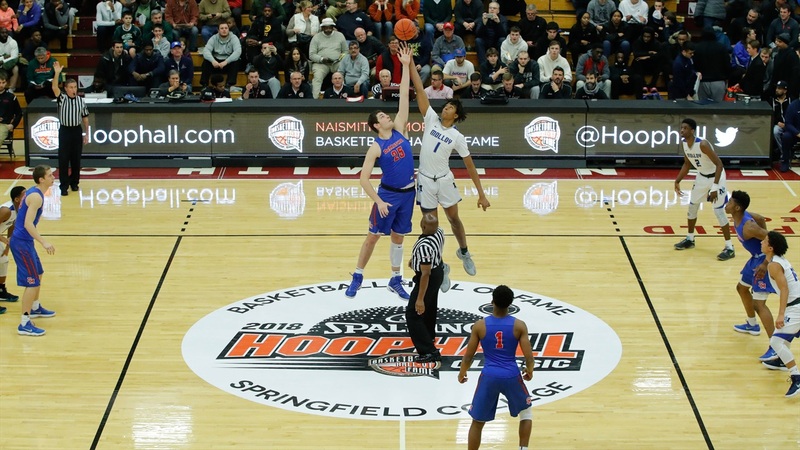 – No high school basketball showcase has as much concentrated talent on an annual basis as the HoopHall Classic at Springfield College. 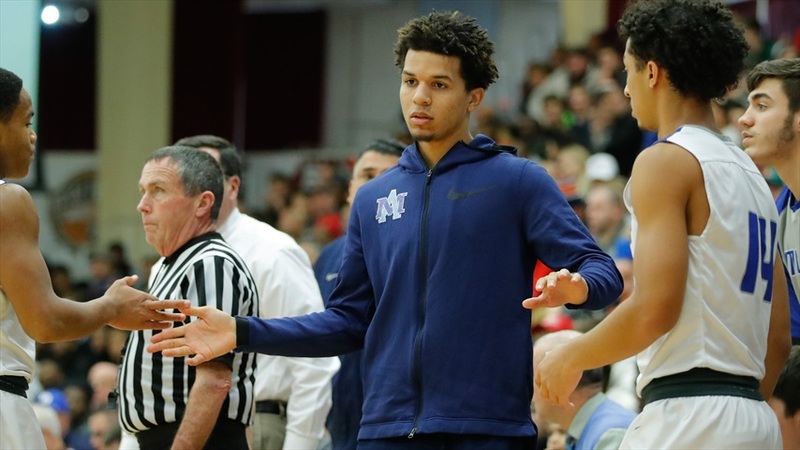 The HoopHall kicks into full gear this weekend and will feature as many players on Notre Dame’s radar as there has been in recent memory, including five-stars Cole Anthony and Hunter Dickinson (pictured above). Irish Sports Daily will be on site for pretty much everything. On Saturday afternoon, Gonzaga College High School from Washington, D.C., will face Olive Branch from Mississippi. Gonzaga, the alma mater of current Irish point guard Prentiss Hubb, has a pair of players the Irish are monitoring in 2020 forwards Myles Stute and Terrance Williams. The 6-foot-6, 215-pound Williams currently has offers from schools like Stanford, Virginia, Maryland, NC State and Georgetown among others. He’s already taken trips to Stanford and Virginia and has a few others in mind, so if the Irish do choose to move on him, it may need to be soon. Oklahoma State, Clemson, Georgetown and Florida have been heavily involved with the 6-foot-5, 200-pound Stute, who has taken an official visit to Penn, strong evidence of how seriously he takes academics. Olive Branch is led by four-star 2019 forward DJ Jeffries, a former Kentucky commit who is currently pledged to Memphis. Sunday will be the busiest day of the event, at least from a Notre Dame perspective. At 12:30, Brewster Academy, of New Hampshire, plays Florida’s Montverde Academy. Brewster is led by 2020 guard Jamal Mashburn Jr. (Don’t worry, you’re not the only one feeling old hearing that name). The son of the former Kentucky and NBA star currently has offers from schools like UConn, Florida, Illinois, Miami, Ohio State along with Princeton and Yale. There have been conflicting reports on whether or not the Irish have offered, but last we checked they had not. Either way, Mashburn Jr. is certainly on Notre Dame’s radar. He plays in the same backcourt as Terrence Clarke, who has already cemented has status as one of the very top players in the Class of 2021, some even have him rated as the top prospect in the entire class. Montverde features multiple top prospects, including a pair of 2019 big men – 6-foot-9 Omar Payne, who is committed to Florida and 7-foot Balsa Koprivica, who has signed with Florida State. Next up, Connecticut’s Woodstock Academy will play Northfield Mount Hermon from Massachusetts. Woodstock features 2019 forward Tre Mitchell, who has a Notre Dame offer. At one point, it appeared Notre Dame and Mitchell were heading in separate ways and while that may be the case in the end, we’re not so sure things are completely finished between the sides just yet. Northfield Mount Hermon is the alma mater of another Irish freshman, Nate Laszewski. Northfield is led by one-time Notre Dame target Chris Ledlum, who is committed to Harvard. Eyes will be on 2020 Chicago point guard DJ Steward in the next contest as his Whitney Young squad faces The Maret School from Washington, D.C. The 6-foot-1, 170-pound Steward has double-digit offers from schools like Illinois, DePaul, Marquette, Creighton, Saint Louis, Xavier, Texas, Florida and Georgia Tech among others. Notre Dame has let the Chicago native know it plans on recruiting him hard. Oak Hill and Anthony, the five-star 2019 point guard, will take the stage next against IMG Academy. Depending on how things shake out with Mitchell in the coming weeks, Anthony could again be the only real target on Notre Dame’s 2019 board. He’s a truly elite prospect who is in conversations as possibly being the top player in the class and some believe he could be in the running to be the #1 overall pick in the 2020 NBA Draft. Another Oak Hill player to keep an eye on is 2020 center Dylan Cardwell. The 6-foot-10, 220-pound junior already has offers from Tennessee, Georgia and Penn State. He’s certainly on Notre Dame’s radar. Meanwhile, IMG features multiple top talents, including one-time Irish target Jeremiah Robinson-Earl, a five-star who signed with Villanova back in November. There’s really only one game on Monday that Irish fans will want to pay close attention to, but it’s a big one as DeMatha Catholic takes on La Lumiere at 5 p.m. That means a matchup between Dickinson, a five-star 7-footer who is the Irish’s top 2020 target, and Isaiah Stewart, a big man who was Notre Dame’s top target in the Class of 2019 for a while. Dickinson has played in the HoopHall multiple times already and held his own each time, including a matchup last year against 5-star center Moses Brown, who is currently at UCLA. DeMatha also features 2020 swingman Earl Timberlake, who is another target for the Irish. Virginia’s Paul VI High School plays on Monday morning. Notre Dame is after Paul VI’s five -star 2020 point guard Jeremy Roach, but Roach has been sidelined the entire season with a torn ACL.